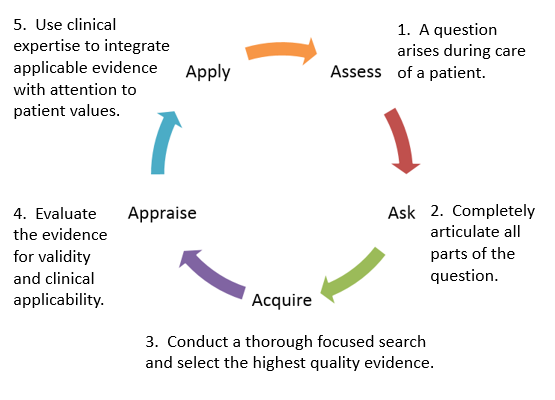 Provides specialty based search examples for practicing the EBM steps related to asking clinical questions and acquiring evidence. and the patient's values & preferences. Fleisher LA. The application of evidence to clinical decision-making in anaesthesia as a means of delivering value to patients. Eur J Anaesthesiol. 2012 Aug;29(8):357-9. Maile MD, Blum JM. The search for an evidence-based method of reducing aspiration. Anesth Analg. 2012 Jul;115(1):5-6. Some clinical questions, particularly in the early years of building clincial expertise during residency, can be answered or informed by using textbooks and other synthesized resources. These resources provide a quick way to determine what is known about a topic at a specific point in time. As pointed out in the quotes above, standard practices can change over time in response to new research so it is very important to stay current with the research in your field and to search journal databases for topics that are undergoing re-evaluation. Provides guidance to improve decision-making and promote beneficial outcomes for the practice of anesthesiology. A selection of direct links to electronic anesthesiology textbooks along with information about how to find more. Provided by the HSL. PICO is a tool that clarifies and focuses questions that arise during a patient assessment. It identifies and organizes the key aspects of a complex patient presentation: P=Patient or Population; I=Intervention or Indicator; C=Comparison or Control (not part of all questions; O=Outcome. Adding Type of Question and Type of Study to the PICO framework to create PICOTT reminds you that different types of study designs are used to answer different types of questions. Evidence hierarchies provide a short-cut to help you filter your searches to the most likely best evidence for the kind of question you are asking. For prevention and treatment questions, start by searching for evidence at the top of the list, systematic reviews of randomized trials. Consider the publication date in the selection process. 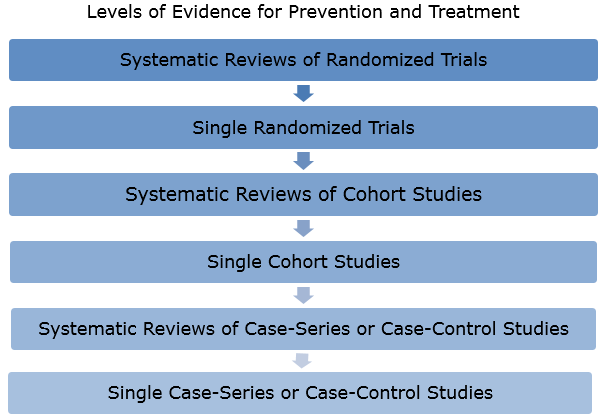 If the systematic review you find was published a number of years ago and found inconclusive evidence, then look for newer randomized trials as your next step. If no evidence is found at the top levels, move down the list looking for systematic reviews and then single studies of first cohort studies and then case-series or case-control studies. Remember that all evidence must be critically appraised. A poorly conducted or reported randomized trial does not provide stronger evidence than the results of a well conducted cohort study. 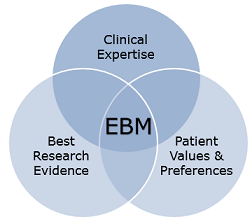 The next step in the EBM process, Appraise, is beyond the scope of this module. Here are some tools that will help you with that step. Guide critical appraisal of articles about diagnosis, harm, prognosis, systematic reviews (of therapy), and therapy. Set of eight critical appraisal tools are designed to be used when reading research, these include tools for Systematic Reviews, Randomised Controlled Trials, Cohort Studies, Case Control Studies, Economic Evaluations, Diagnostic Studies, Qualitative studies and Clinical Prediction Rule.